« A blue Camaro will wear the number 1, but which blue Camaro? 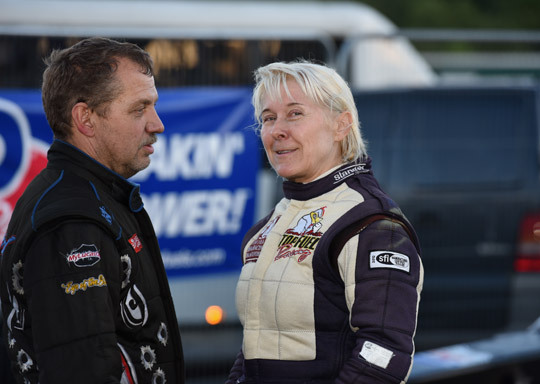 For almost ten minutes Anita Mäkelä must have had the déjà vu feeling of losing the FIA European Top Fuel title in one of the last runs of the season. 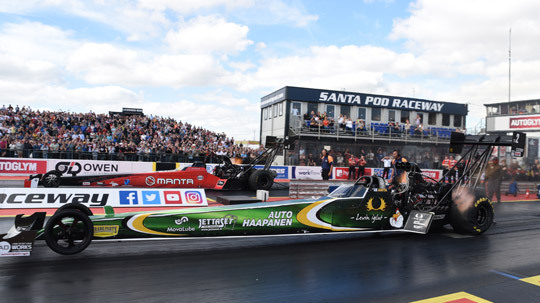 The Finnish championship leader was defeated in the semi-final by Duncan Micallef, and with a win over Micke Kågered in the second semi-final, Stig Neergaard would gain the 20 points he needed to clinch the 2016 FIA European Top Fuel title. 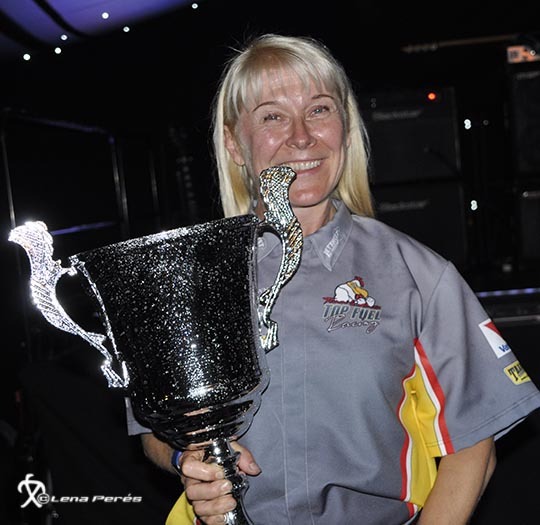 But the Dane ran into problems, was defeated by the 2015 champion and so, to the big relief of the Finnish team, the 2016 FIA European Top Fuel title went to Mäkelä. Duncan Micallef made headlines with his stunning 3.89 second runs, and Kågered finished the season on a high with a European Finals win. 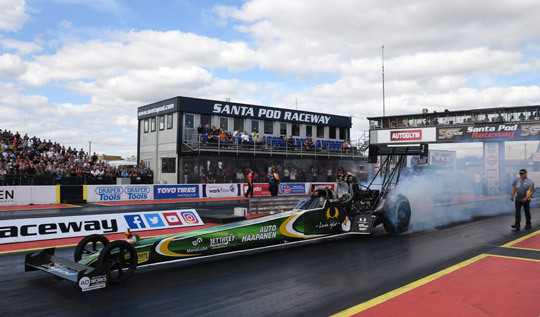 One thing was for sure before the start of the European Finals at Santa Pod, Top Fuel would get a new FIA European champion. But would it be Anita Mäkelä or Stig Neergaard? After his Scandinavian Internationals win, the Dane was only 17 points short of the Finnish leader, and with 20 points for a round win, everything was still possible. Reigning champion Mikael Kågered was 98 points behind in third position, and only had a slim mathematical chance to extend his title for a third consecutive year. 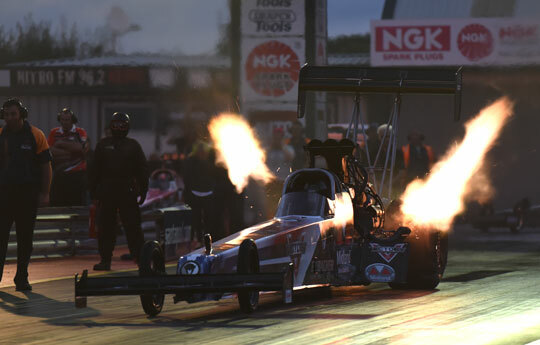 With the forecast of a rain out on Saturday, and a night qualifying on a probably cold track on Friday evening, the teams knew they had to set their time in the first session. 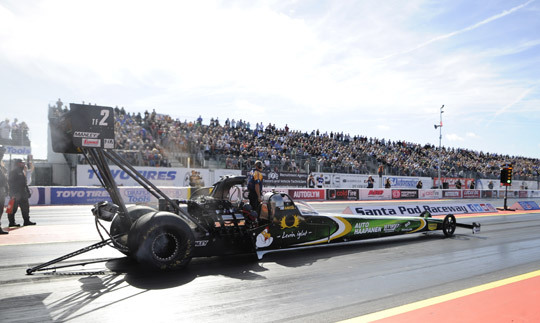 To the delight of his crew, the home crowd and his many fans, Liam Jones stormed to 3.989 seconds at 306.91 mph, his first ever 3 second run, two personal bests, and good enough to claim the number one qualifying position. After a very difficult season with ups, but also too many downs, this run saved Jones 2016 season. 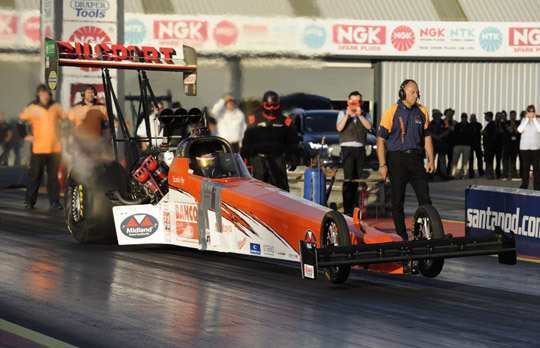 Neergaard ended qualifying in second position with 4.08 seconds, and Kågered was third with 4.15 seconds. Mäkelä had some mechanical problems on her run and the 4.54 seconds was far from what the Finnish combination is capable of and far from what the championship leader was looking for. Behind Mäkelä, Top Fuel rookie Steve Ashdown was in fifth position. Tethys had to abort his first attempt after the burn out when the second Erbacher Racing car was hit by mechanical problems. 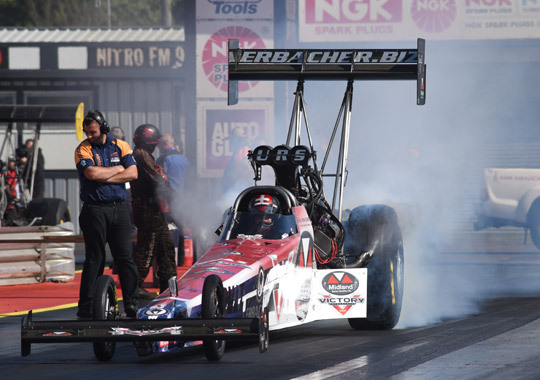 As he had to set his time on a cold track in the evening, Tethys was unlikely to reach a top four qualifying position, and with 5.18 seconds on his second run, he ended qualifying in sixth position, immediately followed by team owner Urs Erbacher. Duncan Micallef had to skip the first run, and like Tethys, the Maltese driver was chanceless in the evening session. With 9.23 seconds Micallef was eighth and last. 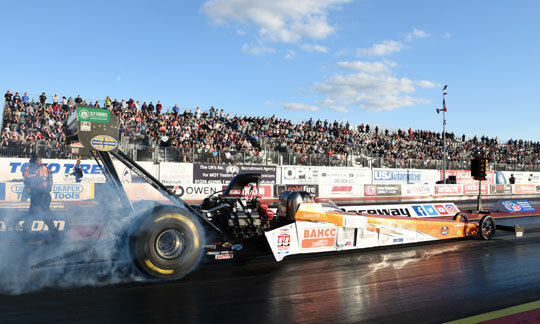 Jones was the only driver with a reasonable elapsed time (4.11 seconds) in the night qualifying, but the 230 mph top speed showed that even the number one qualifier had to lift early. With only one good run in qualifying, the order said nothing about the chances in eliminations. Mäkelä had a walk over when Ashdown had to shut off at the start line. In a bye run Mäkelä improved to 4.03 seconds, and although the run was not trouble free, it gave the championship leader a bit more confidence than the numbers she ran in qualifying. Neergaard kept his championship dreams alive by defeating Erbacher. The Swiss multiple champion had a better reaction time, but was then hit by tyre shake, giving Neergaard the chance to come back and win the race. Both Erbacher Racing cars were out after the first round as Tethys was defeated by Kågered on a hole shot. Micallef was the big surprise of round one. 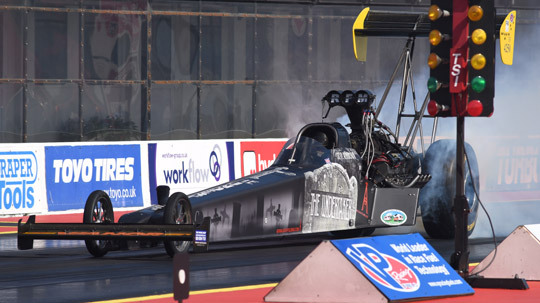 The Maltese surprised at Tierp with 3.91 seconds and even improved on that stunning performance by storming to 3.896 seconds at 311.99 mph, by far the quickest and fastest run of the quarter finals. Jones had serious traction problems, but even without these problems it would have been difficult to match Micallef’s numbers. In the semi-finals Mäkelä had to face Micallef and Neergaard faced Kågered, so if both title candidates won, the last run of the season would decide the championship. With Neergaard waiting in the line-up, Mäkelä had to start first. 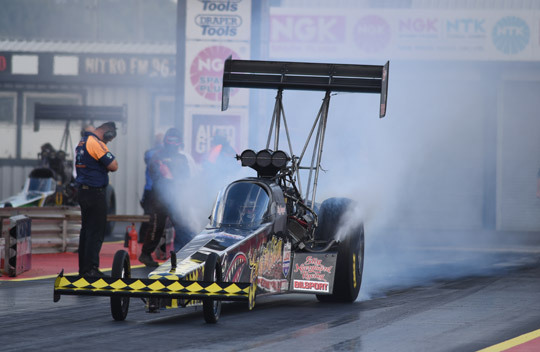 The championship leader was hit by mechanical problems and lost the blower belt, while Micallef stormed to another 3.896 seconds at 312.18 mph and took the win. 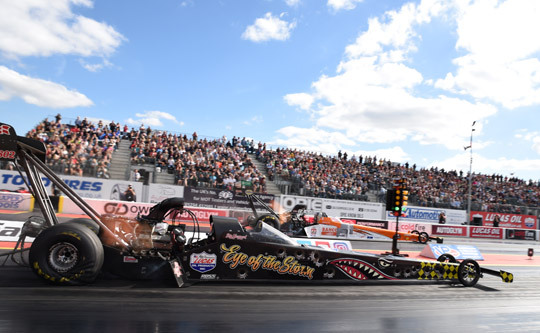 If Neergaard could beat Kågered, the 2016 FIA European Top Fuel title would go to the Dane, and for the second consecutive year Mäkelä would lose the title in the last runs of the season. Kågered had the better reaction time, and just at the moment Neergaard closed in on the leading Swede, his engine let go. 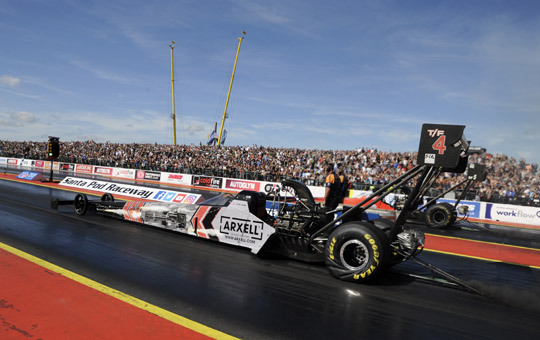 On one of his better runs of the season Kågered took the win in 4.05 seconds, and because Neergaard was also out, the 2016 FIA European Top Fuel title was Mäkelä’s. Kågered took the win in the final on a bye run, as Micallef couldn’t come back in time. 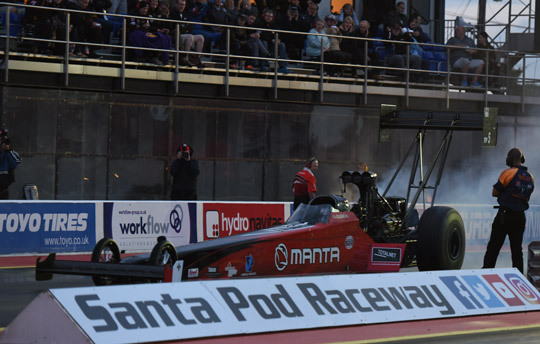 The Maltese driver suffered severe engine damage in the semi-final, and although the team changed the engine in time, another problem arose when they fired up the car and fluid leaked into the clutch. Thus Kågered had to hand the title to Mäkelä, but won the race. 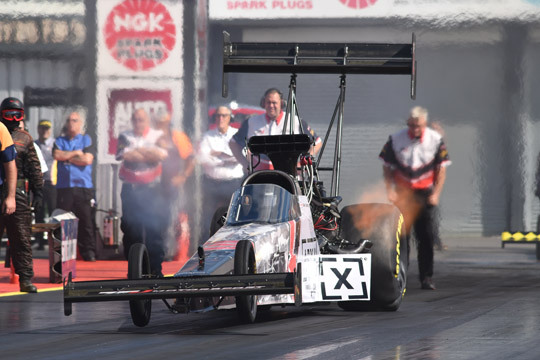 Thirteen points behind FIA European Top Fuel champion Mäkelä, Neergaard ended in second position, with Kågered 55 points behind the new champion in third. 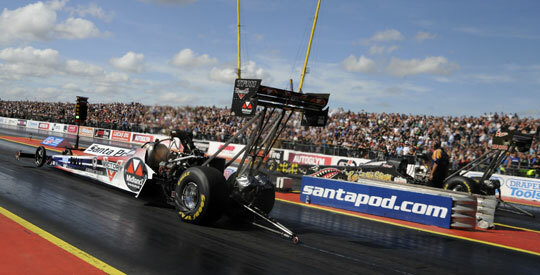 As he was last year, Jones was also fourth in his second Top Fuel season, while Stefan Gunnarsson ended in fifth position. 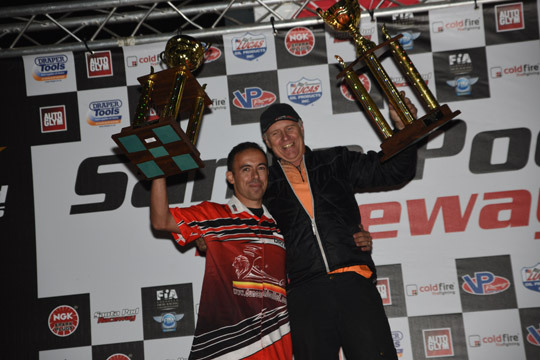 Behind Erbacher, the strong end of the season handed Micallef the seventh position in the championship.